Back of the Cereal Box: Know Your Japanese Subculture Girls! Discussed in this post: video games (initially), Japanese subcultures (mostly) and the wonders of transliteration (somewhatly) and the unremarkable nature of blonde hair in the U.S. (finally). Huh. Girl’s name is Sandy? And she’s enough to turn scores of gamers against a title that eventually became the tenth ever to receive a perfect score from Japanese gaming magazine Famitsu? What could possibly be so objectionable about this Sandy? And what the hell is a gyaru? The answers are part of the word of the week. gyaru (gi-ah-roo) — noun: a subculture of fashion-conscious Japanese women and girls prevalent in the 1980s. According to just about any source I found, the term is a transliteration of the English word gal that fell into usage in Japan when a brand of women’s jeans bearing that name became popular. (The brand’s slogan? “I can’t live without men,” which seems like a better motivator not to buy pants.) Given that gyaru were known for flashy clothes and less-than-mature behavior, you might say that this subculture works sort of like a Japanese answer to the Southern California valley girl. gyaru just want to have fun! But I’m not sure valley girls would have had the wherewithal to construct all the social group signifiers and subsubcultures and subsubsubcultures associated with the gyaru. Take, for example, the himegyaru (“princess gal”), which mixes big hair with party dresses in a way that suggests a 60s-era Nancy Sinatra who died of exposure in the Las Vegas heat. Or there’s the ganguro (“face black”). While the gyaru themselves are known for tan skin and bleached hair, the ganguro take it to the extreme, with catcher’s mitt skin that actually gives you second-hand melanoma — made all the more striking by bizarre white eye make-up. Scary stuff. And there’s even the B-gyaru — literally “B girl,” just like the ones that once breakdanced on the streets of 1980s America — who emulate R&B stars instead of the blonder Staci Sideponytails and Tiffany Slapbracelets. And don’t worry — there are many other varieties of gyaru. Find the one that works for you! Technically speaking, gyaru themselves wouldn’t even refer to themselves as such — they’re more often known today as kogyaro, a contraction of kôkôsei gyaru (“high school gal”) which itself can be reverse-transliterated as kogal. Again, like valley girls, they have their own way of speaking that I’m sure is as irritating to non-gyaru Japanese as valspeak is to the portion of the U.S. that didn’t grow up in 1980s-era San Fernando Valley. They even have a system of writing — or texting, really — that is specific to their subculture, gyaru-moji. So, clearly, this is an established Japanese type who might have had her day long ago but whose descendants are still thriving. Why, then, would game-players unleash so much rage on Sandy the Fairy? Well, this is what she looks like. Pretty innocuous, I’d say. Maybe especially feminine, but to my Californian eyes, she looks like any other tan-skinned blonde girl that you might see here, belonging to any number of American subcultures or none at all. And yet the Dragon Quest diehards hate her to the point that there exists a popular ASCII art Flash game that lets you slap Sandy in the face. 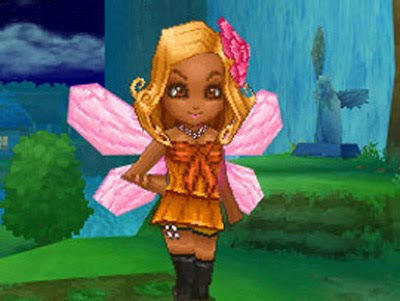 I can only guess that Japanese gamers find this little pixel pixie offensive because she represents Dragon Quest IX’s attempt to cash in on a fad. When Kotaku posted about Sandy, it noted the strangeness of a tanned, blonde character in the Japanese-created game’s medieval-inspired world. The post went on to explain that the title’s creators consciously designed the character to embody this particular style. And I suppose buying into a fad and attempting to profit off a subculture are both the kind of social missteps that can cause a backlash. I mean, this is why people hate Hot Topic, right? I also think it’s interesting that no such backlash could exist against this character in America. For one, most gamers wouldn’t know or care about gyaru culture. And for another, a gyaru rendered in cartoon form becomes indistinguishable from a run-of-the-mill California sunbunny. There’s something in here — a strange, subtle cultural reciprocity, what with the word gal being absorbed unrecognizably into Japanese as gyaru and the gyaru look passing invisibly back into American culture when Dragon Quest IX gets released here this summer. And that is neat. Full disclosure: I probably will never play Dragon Quest IX and am apathetic toward Sandy the Fairy. But I still enjoyed slapping her in that little Flash game. Not only do the gyaru have their own language, but they have their own Pokemon! According to the article, Smoochum mat be based on a ganguro, and I can see why. Oddly enough, Jynx, its evolution, also made some American people mad because of her skin color too. May I ask, since when is there a rule against dark skinned video game characters!? Didn't know about that, but as for why that dark-skinned thing might infuriate black people, I can totally understand. It does look like a pickaninny or a blackface performer or certain other characters that once upon a time depicted black people as simple and with cartoonishly exaggerated features. Whether the designers meant to evoke such images, the character would have doubtlessly been read that way in the U.S. And that would be a bad thing. Racial sensitivity aside, it was a smart economic move to bypass controversy altogether and just alter the character.